Today we’ll be talking about one of the most familiar Cub Scout activities there is: The Pinewood Derby. Without a doubt, some of you will already be familiar with this event. Maybe your parents or even grandparents have told you about it, or have helped you with your own Pinewood Derby in the past. Let’s take a look at the history behind this iconic race and what makes it so special for Scouts. In 1952, Don Murphy, Cub Master for Pack 280C, wanted to create an activity that he could do with his 10-year-old son. Soap Box racing (due to its risks) was limited to older children; so he had to come up with something similarly exciting but with less risks. He designed, what in essence, was a miniature version of Soap Box racing; the cars themselves have no propulsion but instead were moved by gravity and limited to a small track. Don, being a model maker, was able to develop a basic kit for the cars and now only needed something to race them on. He enlisted his fellow Pack Leaders who jumped at the chance to make a track for their scouts. The first Pinewood Derby was held at the Manhattan Beach Scout House in Los Angeles on May 17, 1953. The scouts were given a month to build their cars and customize them. The reception from the participants was staggering – the place was packed to the brim with both scouts and their parents. In 1954 the first race not limited to the Cub Scouts was held in Griffith Park. By the next year’s finals, over three hundred people would attend thus solidifying the Pinewood Derby as a hit. The event became so popular that Don Murphy wrote up a rulebook for the Pinewood Derby and sent it to the Boy Scouts of America (BSA) National Office with the intention of spreading the event to all Cub Scout Packs. Eventually the BSA hired model airplane builder, Art Hasselbach, to create a Pinewood Derby car kit from Don’s original specifications. This kit would have all the necessary parts for anyone to create their own car and was soon advertised in the 1955 Cub Scout Program Quarterly. After that, no scout event would be complete without it. The event has even been adopted by many other clubs and organizations since its inception – allowing millions of people to enjoy the principles of craftsmanship, creativity and good sportsmanship. The Girl Scouts, Royal Rangers, Woodcar Independent Racing League, and even the US Military have their own races regularly. Don Murphy was in fact so proud of the effect the Pinewood Derby had, that he called it his most outstanding achievement. 50 years later, most of the rules and regulations of the Pinewood Derby are pretty much the same as they were originally written—a testament to how solid Don Murphy’s original ideals were. It’s become one of the most popular of the Scouts events; and an untold number of children have built their own Derby cars since that first race in 1953. Don Murphy passed away in 2008 at the age of 90, but he left behind a legacy that continues to bring smiles to children and adults of all ages. One of the secrets of the Pinewood Derby’s longevity is the fact that it’s become a tradition: parents love working on the cars with their children and love remembering the days when their own parents helped them with their cars. That is, at its core, what the Pinewood Derby is all about: two generations coming together to create something memorable that a child can treasure for a long, long time. 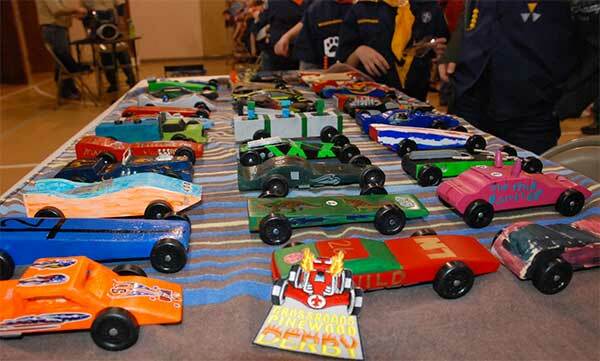 Many former scouts still keep their old Pinewood Derby cars – decades after they stop being scouts. Rewarding children for being creative and working hard is one of the most effective ways to teach the value of diligence and industry. If you’re organizing a Pinewood Derby for your Scout Pack, we can help you by providing easily customizable trophies, medals and awards. Don’t miss this chance to make your event one of the most memorable times for your Scout Pack! Great Lakes Trophies is ready to serve and can be reached easily at 734-266-1815 or through our online contact form.